Description: NS 7139 is at Aiken, SC in this 1999 photo. This line is now operated by the Aiken Railway. Description: NS 7139 switches the NS yard in Hattiesburg, MS. Description: NS 7139 switches the yard in Hattiesburg, MS. Title: NS 214 @1110 hrs. Description: A trio of EMD GP60s power eastbound TOFC/Stack train as sun breaks out behind the power. Description: GP60s 7128 and 7139 make up the final two units on train 214. Description: Number 3 in NS stack train consist. Description: Norfolk Southern hotshot intermodal train #204 heads north, about to cross E. 36th Street in Charlotte, NC. This is an Atlanta to Alexandria train. GP60 #7111 was delivered to the NS in August of 1991. She is trailed by three classmates, all from the same original order and delivered within two months of the 7111. We are in the Charlotte District of the Piedmont Subdivision. 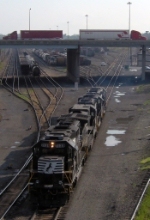 This was one of my earliest digital train images. Title: NS EB 214 @ 1024 hrs. 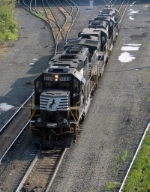 Description: Norfolk Southern Eastbound Autorack/Intermodal Train 212 Passes South 13th Street. Description: The top two modes of freight transportation; Tractor Trailers & Railroads. Description: 337 with a trio of GP60's along with a D8-40CW and D9-40CW pulls hard past MP SC 89 with over 35 cars of DODX loads on the head end. 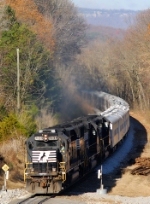 Description: A spectacular veteran EMD lashup leads hotshot pig train 213 up Yadkin Hill. Description: NS Eastbound Intermodal Train 202 ( Memphis, Tn. to Atlanta, Ga. ) passing through Brompton, Al. Description: NS Eastbound Intermodal Train 202 rumbles through Brompton, Al.